Check here to share in our customers' experiences and read the reviews they've shared. "Took my little babies here today on a whim to try another small business and I was beyond impressed. Thank you for taking such amazing care of your work and my babies. We will be back!" "Took Flora for the first time today. It was a great experience! Thank you, Michelle!" "Betsy has been grooming my cats and dogs for many years....she's the best!" " Canine Carousel did an amazing job on my dog. From beginning to end, they were prompt, professional and really good with him. Riggins and I will be coming back again!" "Thank you Canine Carousel! Misty Rose is looking good and all gussied up for Thanksgiving!" Absolutely terrific. 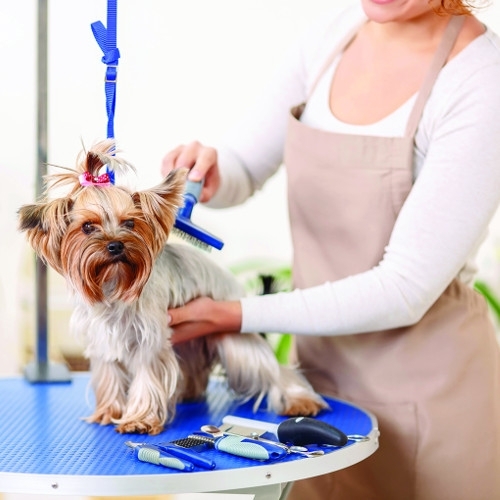 The groomer (20 years experience) and owner were VERY friendly, love their jobs, and very caring for the pets. I happened to stumble across them when the nearby (less than a mile away) competitor that I went to once in the past wouldn't take my "very large" dog (he is 52 lbs, hardly very large) until over 3 weeks, they are just too hard to work with in many ways.... so I called Canine Carousel and they took us the very next day. So glad we had to make the switch. Terrific work, attitude and very accommodating. HIGHLY recommended. I moved to the area from Los Angeles and am VERY picky about dog groomers. I hadn't been able to find one I liked yet so my Yoshi (an albino Shitzuh) had matted hair . I checked out Canine Carousel before taking Yoshi in, and saw how absolutely cute it was! Very clean and well-maintained! I made an appointment and I am BEYOND PLEASED with the haircut they have my little Yoshi!!! All his matted hair is gone and his cut is perfect! The owner, Lil is soooo sweet and amazing at her job! I have found my pet salon!!! Thanks so much!!! Favorite and only dog groomer used in the last 20 yrs. Family owned business makes a big difference with the attention and special care which our pets receive while visiting there. Scheduling very accommodating with 2 locations. I moved here from NY and looked around a bit for a groomer. This place is perfect. They do an amazing job. I moved to Ashburn a year ago and have been searching for a fantastic groomer. I finally found one! Canine Carousel is beautiful and clean. The staff is experienced and professional. Best of all my princess looks adorable! I would highly recommend them. This is the place you want to take your pets! The owners operate and run this business themselves! They care a lot! They truly want to please the customer! They are still renovating and expanded! A must see! Took Cooper in for the first time couple of weeks ago after our previous groomer relocated. What a difference ! From the first phone call to checking us in to accommodating Coopers quirkiness to answering all the million and one questions I had. Everyone was extremely patient with us. For the first time in years, Cooper came out looking like one handsome Westie! And he didn't want to go home. He was browsing the store front shop more than I was. That only tells you how relaxed he was and how much he liked it there. Thank you for taking care of Cooper as he was your own ! They always do a great job grooming our dogs and the customer service might be the best of ANY BUSINESS I have ever experienced. They have a customer for life now with the King's. Took my little babies here today on a whim to try another small business and I was beyond impressed. Thank you for taking such amazing care of your work and my babies. We will be back! Betsy has been grooming my cats and dogs for many years....she's the best!